The duo that took the literary world by storm is back in a brand new, amazingly fun adventure. Nick and Tesla are twins living in a very small town. This was bad before, but now the incessant boredom is even worse because of the huge adventure they just had. Soon, thankfully, a new event happens and Nick and Tesla throw themselves into it with gusto. Their friend’s family business has been robbed; someone has stolen a comic book from their store and the twins vow to get it back. This investigation turns a little odd when, as they’re tracking down the bad guy, they continue to run into robots. The robots seem to be everywhere, from hanging out at the pizza house to standing in other stores around town. Not exactly ‘evil’ buckets of bolts, these robots are actually gifts to the owners of the stores from a brand new resident. Dr. Hiroko Sakurai has opened up a gadget shop in town, and the robots are her way to make friends with the locals. Even though she seems nice, Nick and Tesla feel a bit wary about the new face in town. Using their Uncle’s laboratory in the basement and other normal, everyday things, the twins begin to create their own robots in order to help find the comic book thief and uncover what, exactly, it is about the new resident and her robot army that just doesn’t seem to be on the up-and-up. The diagrams, pictures, and instructions found in this book are awesome. 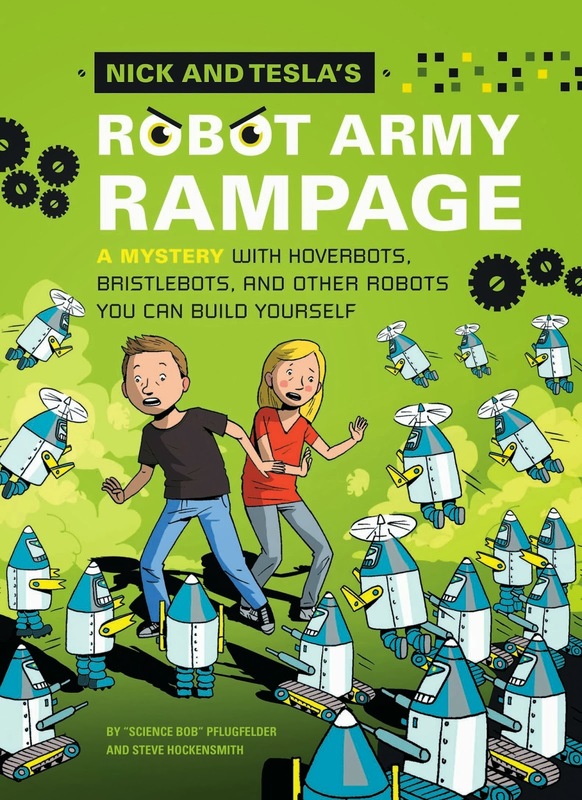 Readers can build the Super-Soaker Bot Blaster and still enjoy a story that is super-cool. Readers who haven’t yet jumped on board with this series should do so immediately! The first book had middle-grade readers hooked, and this one has the ability to hook every age group that wants to explore, learn new things, and have a ball. Quill says: Nick & Tesla offer a brilliant spark to fiction, and make science the most fun it’s ever been!